Come relax and enjoy this cozy log cabin, relax on the covered porch or the dock and enjoy a barbecue on the grill or over the open fire pit. 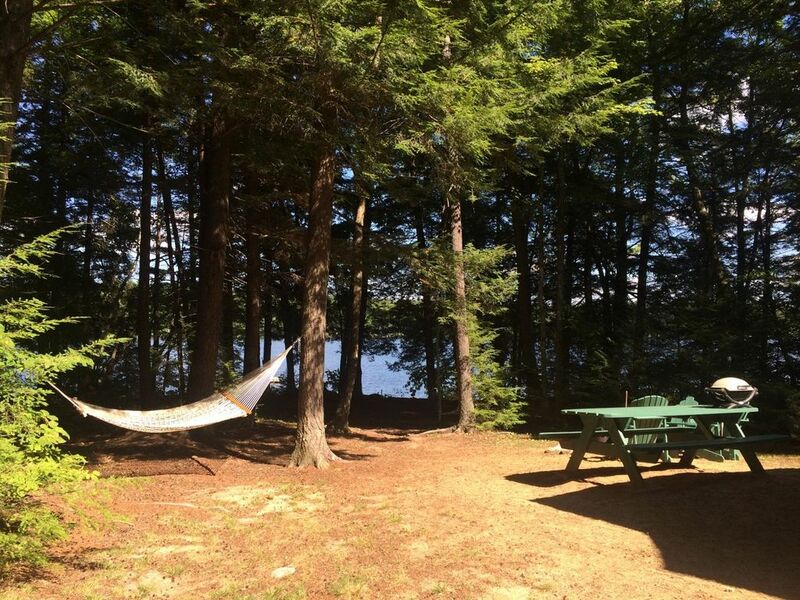 Kayak around the pond (two kayaks come with the rental), listen to the loons and enjoy swimming, fishing and hiking. This is a small three bedroom camp which is suitable for a small family. Bedroom one has a queen bed; bedroom two has one set of bunk beds and the third bedroom has 2 single beds. One well behaved dog would be considered. The cabin is about a 15 minute drive from downtown Bridgton which offers a movie theater, numerous gift stores, Renys, Hannaford, book stores and countless dinning choices in the area. The cabin is also an easy commute to the Stone Mountain Art Center if you would like to take in a show while in the area. Check it out at for a listing of upcoming shows. North Conway, New Hampshire is about a 30 minute drive away for additional hiking options, outlet store shopping, train rides, Storyland or paddling the Saco. This is a season rental June through October. Rentals run from Saturday to Saturday during peak season. 3 night minimum stay June and September. Cabin is one hour from Portland, Maine and two hours from Boston, MA. The cabin on Woods Pond is a wonderful and magical place. My family and I did not want to leave. The cabin was clean and enchant ally decorated. You did not miss a beat!! Our weather was on our side as well. We are all looking forward to returning again. We returned to this cute cabin for the second year in a row, and we fell in love all over again. The cottage has everything you need, the location and setting are perfect, and the kayaks are even easier to access this year, down on the dock. We started every morning with coffee in adirondack chairs down on the dock, with the great blue heron and the loon for company. Although we eventually went out to Beth's Diner for breakfast for internet, the lack of wi-fi was really a secret benefit. Being disconnected for awhile does us good! The outdoor picnic table, fireplace, and grill are great fun, and we enjoyed entertaining our local friends there. Communicating with Wendy is easy, and she is very responsive. The directions for using the house are clear. The Fureys have thought of everything that's needed, and we felt we could just relax. (A hairdryer would be an added luxury; don't forget to bring one). We hope to return every year! Thank you for the glowing review. We are so happy that you enjoyed your stay and we love sharing the cabin with people who enjoy and appreciate it. For future reference...the hairdryer is in the bureau drawer in the bedroom :). Sorry you didn't find it! I've noted that, and will try to remember to leave it in a more obvious spot! We love Beth's and visit there often ourselves! We enjoyed having you as guests and would welcome you back anytime. Thank you for leaving the camp so tidy. We really appreciate it. We had such a great time staying at this property, which was a perfect blend of civilization and nature. We loved the rustic, cozy decor. The cabin was well-outfitted with everything we could have needed, plus lots of additional things - depending on the situation. The 2 available kayaks, plus the grill, fire pit and swimming raft were all big hits. We had grand plans to go for a day hike in the White Mountains, or head to Portland for the day - but once we were at the lake house we had little desire to go anywhere else! Overall, this was a very peaceful location - just what we needed! And we appreciated being able to have our dog with us - he had a blast as well! Beautiful site, but the mothball smell in the cabin (I think it was the living room rug) was so over powering, I hated to just sit inside. The smell was so strong, I could still smell it on my clothes when I returned home- I re-washed everything even though I didn't wear it on the trip! Very disappointing that your stay wasn't perfect. We take pride in our property and this shows in the comments and positive reviews we are accustomed to receiving from our guests. This is the first time we have received a complaint about mothball odor but we will certainly take any steps necessary to correct this issue. When we opened the camp this spring we discovered evidence that mice had entered over the winter. We consulted other cottage owners who recommended mothballs over using poison as a deterrent. In April we put mothballs in the crawl space under the cottage. We had guests prior to your stay and after your stay who have left very positive feedback. Our most recent guests took the time to leave a personal note thanking us, complimenting us on the accommodations and indicating their desire to return next year. We also spent a week directly after your stay at the cottage. This is the first we have heard or noticed ourselves that the mothball odor is noticeable/strong. Again our apologies. The view of the pond, whether from the cottage or from the little dock, was an enchanting way to start each day. We loved the freedom to visit our Woods Pond friends by kayak, the comforts of home but the delights of paradise...we enjoyed swimming to the swimming raft, the well-stocked and thoughtful items in the cottage. We had a fantastic week...already dreaming of next year! My husband and I loved this very cozy cabin right on the pond. We are avid fishers and we were able to tie our kayaks up to the dock so we could just jump into them quickly when the urge over took us! Which was sunrise to sunset. Lol! The fishing was excellent! Bass, brown trout, perch, pickerel. Just being on the water surrounded by the beauty of nature is priceless. The cabin was exactly what we hoped it would be. We spent our nights either sitting on the porch or cooking our supper over the fire pit. Hardly any pesky bugs! A huge plus was that we could have our dog with us. He loved it too. Great walks around the pond and at nearby hiking trails that allow dogs. So many memories were made and our souls are rejuvenated. We really hope to make a reservation soon for this wonderful spot again next summer. It warms our hearts to know you enjoyed your stay. We love this special place and enjoy sharing it. Thank you so much for visiting, leaving the camp in such excellent condition and we would love to welcome you back anytime.